Sonoran Orthopaedic Trauma Surgeons and Hip Center (Scottsdale) - Book Appointment Online! Dr. Gil Ortega is fellowship trained in orthopedic trauma and reconstruction. Dr. Ortega’s interest in orthopedic surgery began when he was an orthopedic patient. While playing football, he suffered a multi-ligament knee injury that required multiple surgeries. Through his surgeries and recoveries, Dr. Ortega has experience as a patient, which he believes helps him provide high quality health care with a passionate and dedicated service to all of his patients. Dr. Ortega’s clinical interests include sports related and traumatic fractures, anterior hip and shoulder replacements, fracture nonunions, fracture and soft-tissue complications, and pelvis/acetabular fractures. 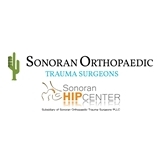 Sonoran Orthopaedic Trauma Surgeons and Sonoran Hip Center are dedicated to the treatment of complex fracture and reconstruction care.